Hyper-Threading in a Pentium? It's blasphemy, and also pretty cool. It's far from the fastest chip on the block, but the ultra-low price covers a multitude of sins. Intel's Kaby Lake hasn't changed the CPU market in any meaningful way, with slightly increased clockspeeds and a few new features that don't really matter for most users. 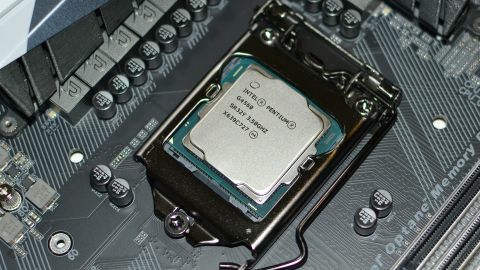 From the halo i7-7700K to the 'budget overclocker' i3-7350K, most users will greet the new chips with an indifferent shrug. It's not that the chips are bad, but they're such a small upgrade over the previous generation that it makes very little difference to most of us. But then Intel did something quite unusual, enabling Hyper-Threading for the first time on the Core series of Pentium processors. We haven't seen a Hyper-Threaded Pentium since the venerable Pentium 4 and Pentium D back in the mid-'00s. Much has changed in the last ten years, but the extreme budget pricing on the Pentium G4560—it retails for $65, including an Intel heatsink and fan—makes this potentially the most interesting budget CPU Intel has released in years. But don't get too excited, because while it's about half the price of the Core i3-7100, there are a few key differences. Of course it's clocked lower, 3.5GHz compared to 3.9GHz, and it has HD Graphics 610 instead of 630 (about half the potential graphics performance), but it has the same 3MB L3 cache. None of those are too big a deal, but there's one major difference: the Pentium G4560 doesn't support AVX instructions. That might not seem like a huge deal, and depending on the applications you're running, it isn't. But when you combine the dual-core nature and a moderate clock speed, Intel had to axe something to justify the price. Otherwise, there would be almost no reason to spend $120 or more on the Core i3 line. But I'm far more interesting in the gaming potential of the G4560. Most games don't really need four physical CPU cores, particularly if you're using a moderate discrete GPU. So how does this budget chip fare? If Intel had gone all-in and made this a sequel to the Pentium G3258 Anniversary Edition—meaning, give it an unlocked multiplier—we'd really be in for a treat. As it stands, the chip clearly struggles at times with heavier workloads, so forget about video editing or live streaming your gaming sessions. There are also clear limits to how far you should go up the graphics card ladder when using a chip like this. But if you're trying to keep costs as low as possible while still building a gaming PC, this might be just the sort of processor you're looking for. I've included all of the major CPUs for the above charts, with both Skylake and Kaby Lake parts along with AMD's FX-8370 and A10-7890K. I'm still waiting for Ryzen as well, though it doesn't sound like AMD plans on releasing anything in the $65 range anytime soon. Which is fine, because AMD already has the Athlon X4 860K, a GPU-less version of the A10-7890K at half the price, with the ability to overclock to the same 4.3GHz level. So when you look at the charts, you can sub in the 860K in place of the 7890K. Once you do that, the budget battle gets pretty interesting. In overall CPU performance, AMD wins by about 10 percent, and in individual tests the gap is even larger. There are also a few instances where the lack of AVX support proves damning, like y-cruncher where the i3-7350K is three times faster. It would only be about 20 percent faster if it weren't for the heavy use of AVX instructions. But for single-threaded performance, even the lowly G4560 holds nearly a 25 percent lead over AMD's various Bulldozer-derived parts. Games tend to track much more closely with single-threaded performance, even when they benefit from multiple cores, which is why I really wanted to see what the G4560 could do in games. You can see the same Kaby Lake testbed I've used elsewhere in the above boxout, which is complete overkill for the G4560. I use a standardized set of hardware to avoid influencing performance with other factors, like DDR4 memory speeds, graphics card, or SSD performance. No one should be looking to pair a $600 graphics card with a $65 CPU, but I did exactly that for the gaming benchmarks. More on this in a moment; first, let's look at how one of Intel's least expensive CPUs does with Nvidia's top gaming GPU. I mentioned how games often track more closely with single-threaded CPU performance than heavily-threaded tests, and that's precisely what we see in the gaming charts. Overall, even with two physical cores and two virtual cores compared to the FX-8370's eight physical cores, the two CPUs deliver very similar gaming performance. That's not to say the FX-8370 is slower, but half of the cores are typically sitting idle while gaming. Even Ashes of the Singularity, a game known for beating up CPUs, has the G4560 basically tied with the FX-8370. There are really only three games that favor (by more than five percent) AMD's FX-8370. Hitman is the obvious one, scaling extremely well with the extra CPU cores and delivering 42 percent higher performance. But it's really the only clear win. Battlefield 1 gives the FX-8370 a seven percent lead, and Shadow Warrior 2 has a nine percent lead, but everything else is either a negligible difference of less than four percent, or an outright with for the G4560. Fallout 4 is the best showing for the G4560, beating the FX-8370 by nearly 20 percent. The Witcher 3, which is effectively CPU limited with all the Intel chips at our maximum quality test settings (including HairWorks and HBAO+), still gives the G4560 an 11 percent lead. And Rise of the Tomb Raider shows an eight percent lead. If the comparison is between something like the i5-7600K and the G4560, the gap is far greater. Only two games—The Division and The Witcher 3—don't show much of a difference. Everything else shows double-digit percentage increases with the Core i5 part, with an average improvement in gaming performance of 30 percent. Of course that's at nearly four times the price, but there's still a clear difference. Using a mainstream GPU like the 1060 FE, suddenly the importance of the CPU is greatly diminished. Civilization VI really leverages the extra CPU cores and clockspeed, with a 52 percent performance lead from the 5930K OC. To a lesser extent, Battlefield 1 (20 percent), Shadow Warrior 2 (12 percent), and Ashes of the Singularity (12 percent) also show an advantage to the faster CPU. But performance in the other games is all within about five percent—and this is using the ten games in my current test suite that showed the greatest improvement when using a faster CPU. Think of this for a moment. Using an overclocked $600 CPU against a stock $65 CPU, with a $240 graphics card, the average performance improvement in ten games is only ten percent. And you can definitely play games on the Pentium G4560. Budget computer parts are often difficult to recommend. It's not that they're terrible, but the Pentium G4560 is slower than any Core i5 or i7 processor released in the past six years. If you have a PC with such a CPU, you wouldn't want to downgrade by moving to the G4560. But if you're trying to get into the PC gaming scene and you don't have a lot of money, that's a different matter. The Pentium G4560 still uses Intel's latest architecture, which means low power requirements and modern motherboards. You could stick the G4560 in a $65 H110 motherboard, add in 8GB RAM, a hard drive, case, and power supply, and all you need is a graphics card to create a decent gaming PC. Everything except the graphics card can be had for about $250-$300 (depending on your choice of case and PSU), and then add a moderate GPU like the RX 470 or GTX 1060 and you're in business. Not surprisingly, Intel doesn't do much in the way of marketing the Pentium G4560—or any of its Pentium and Celeron chips. Core i7 is undeniably faster, and it also makes Intel significantly more money. All of Intel's marketing muscle goes into promoting their halo products, but the budget chips still warrant a look for frugal gamers. For non-gaming workloads, you can make a reasonable argument that AMD's budget parts are a better choice. But until Ryzen comes out (and perhaps not even then), the best budget gaming processor is now the Pentium G4560.